DISCONTINUED PRODUCT - Please click Bledsoe Revolution 3 to see a comparable product. The Bledsoe Lever Lock Knee Brace provides post-operative support and protection after knee arthroscopy. It features a quick extension lock design for arthroscopic ACL reconstructions. The levers quickly lock and unlock for ease of use: Unlock them to allow motion for rehabilitation or passive motion exercise, and then lock them in full extension for ambulation or sleeping. The Bledsoe Lever Lock knee brace comes with full foam liners over the thigh and lower leg, and comes in three sizes to fit every size individual. The product also comes with tamper resistant ties that can be applied after surgery to ensure patients do not tamper with the hinges following surgery. Hinge upright pockets attach quickly to foam wraps with hook-to-pile closures. One piece strap-to-wrap for faster attachment. Hinge allows full range of motion when unlocked - cannot set the hinge in any other range except for full extension when the lock is applied. A small anti-migration strap is laced through the foam wrap to reduce slippage of the brace. Tamper-resistant tie seals for hinge are provided for patient compliance. 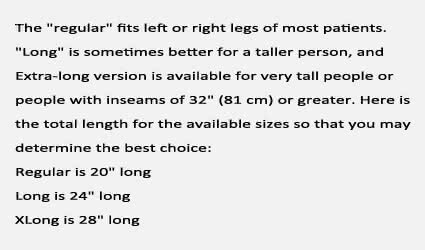 NOTE: If all of the above versions seem too long, Bledsoe recommends their Basic Post-Op brace, which can come in a 16" length. The Bledsoe Lever Lock is indicated for immediate application following arthroscopic reconstruction of the anterior cruciate ligament or other procedures or injuries which require locking the knee in full extension with intermediate periods of full range of motion. Easy to wear Review by Dominick S.
Brace was very comfortable and easy to put on. The hinge easily locks so that I could keep my knee immobilized after surgery.